Today's my Birthday, and I've put together a list of Birthday Mysteries! 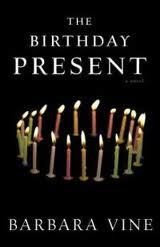 Just what I want to be reading today: Birthday Crimes! Happy Birthday Janet. Hope you have a wonderful day filled with chocolate and all your wishes coming true. Great blogs...love the cake recipe, and the list of birthday mysteries! Hope you are having a very happy day. To Uriah's point ... I have to say that my father, who was also an Aries, was decidedly NOT "mild mannered and easy going." But then, perhaps he was an exception in this way, as in so many others. HAPPY BIRTHDAY, JANET!! Hope it was brimming with lovely surprises. Er...I've NEVER, in 37 years as an astrologer, known a totally "mild mannered and easy going" Aries. To many more and much ado about chocolate! My sister, who is an Aries is the most energetic and driven person I know. Is that an Aries trait? I love it! And Happy birthday, Janet! I would never have guessed there to be so many! Happy Birthday, Janet! I hope the day was filled with everything you love. Great list! I'm printing it out - what a clever and fun idea for an unusual birthday gift to a reader. Funny that I've never put a Birthday list together before... remedied! The birthday bash is intense. Not for the weak.